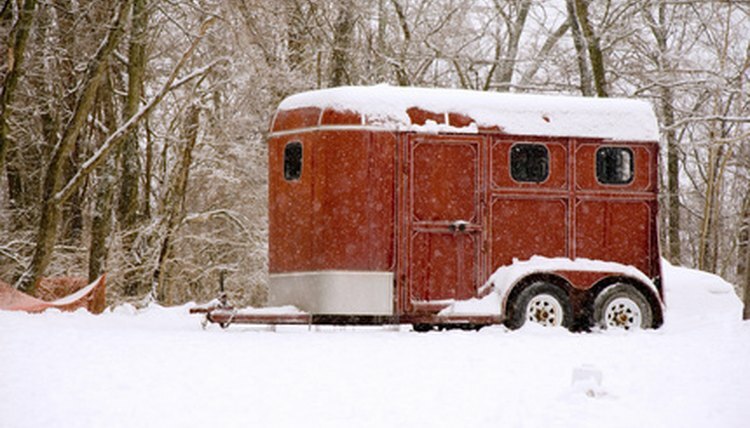 Horse trailers can be made more comfortable with the proper insulation and correct installation -- either for your horse or for yourself as conversion into living quarters. Styrofoam insulation and an extra wall of galvanized, no-rust steel will need to be added to the interior sides since most horse trailers come with single-wall aluminum sides. A one-piece roof design will prevent leakage from the elements better than sealing and caulking rivets and seams on the roof. Cut out insulation sections with a utility knife to fit along the sides of the trailer between the beams. Insulation also may be added to the ceiling and floor of your trailer. Cut into the backside of the insulation with 1/2-inch spacings when fitting the insulation to curved areas within your horse trailer. Do not cut all the way through so that you can bend the insulation. Secure the insulation with 2-inch aluminum tape. Attach edges of the insulation with the tape along the beams. Aluminum tape will withstand hotter temperatures. Seal and caulk the roof's rivets and seams to prevent rain leakage. Another option is to install a seamless one-piece steel-reinforced roof made of fiberglass. This kind of roof is bolted to the side walls from the trailer's interior.